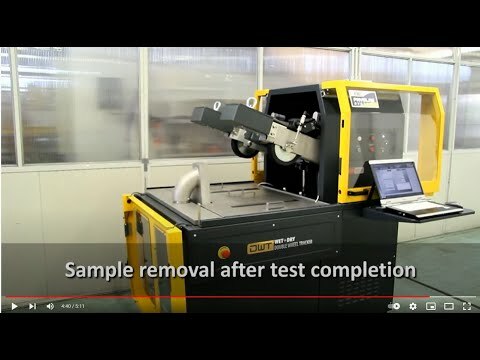 The wheel tracking test is used for determining the susceptibility of Hot Mix Asphalt (HMA) to deform under load by measuring the rut depth formed by repeated passes of a loaded wheel at a fixed temperature. Two versions available as prescribed by EN 12697-22 Small Size device: specimen conditioning in air and in air or water. Both versions can be upgraded with automatic system which lift one of the wheel from the specimen that has reached the rut target continuing the test on the other specimen. See Upgrading options Automatic wheel lifting mechanism. We also produce Wheel Trackers conforming to AASHTO T324 standard and a universal version conforming to both AASHTO and EN standards. See Hamburg type double wheel tracker and Universal AASHTO/EN double wheel tracker. The DWT Double Wheel Tracker can be used as part of your Superpave performance based testing program. The EN versions are fitted with double solid rubber tyre, 203 mm dia. x 50 mm wide. The wheel load is 700 N. The system includes a motorized lifting system for raising the wheel assembly at the end of the test. The EN prescribes either air or water environment. A water level of about 20 mm above the sample has to be maintained. Where a heated air environment is specified, the specimen, during testing, must be maintained at uniform and constant specified temperature ± 1°C. The DWT Double Wheel Trackers fully satisfy and exceed the above requirements: the temperature accuracy is ± 0.5°C.